I ran out of time in my last post to tell you about a truly terrific book that I read over spring break vacation. 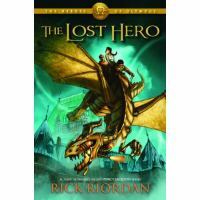 It was The Lost Hero by the one and only Rick Riordan. This book ROCKS, ROCKS, ROCKS AND ROLLS!! Jason wakes up on a bus. He has no idea where he is, why here's there or even WHO he is! He learns that he's on a field trip to the Grand Canyon with a camp for troubled kids. Two campers, Leo and Piper, say they know him but before he can find out anything, the campers are attacked by venti, storm spirits who throw Piper into the canyon and shoot Jason with lightning. And that's just the first two chapters! There's a lot more. The war with Kronos and the Titans has awakened older, larger and more powerful foes. Not only that, these ancient enemies have captured Hera, queen of the Olympians. If she is not rescued, the result could be so terrible that even Chiron is afraid. Leo, Piper, and Jason must go on a quest to free Hera or else--or else--oh, man, it's too awful to think about! On top of that, one of the giants has captured Piper's father and promises to kill him if she doesn't sabotage the quest. On top of that, Percy Jackson is missing! Could things get any worse? You've got to read this one to find out what becomes of these three heroes! This book is the first in a new series. The next one will be The Son of Neptune and will come out this fall. Can't wait!! In the meantime, check out the Heroes of Olympus website. A lot of you have probably already read The Lost Hero since it came out way back in October. What did you think? Did you like it? Were you as "wowed" as I was? Go to the Comment tab under this post and let us know! Howdy Ho, all reader guys everywhere! I'm feeling GREAT today because I just came back from spring break vacation. 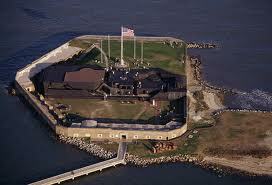 Saw a lot of cool stuff but one of the best things was Fort Sumter in Charleston, South Carolina. It was an especially good time to go because it marked the 150th anniversary of the beginning of the Civil War. 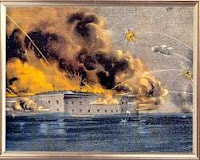 For those who don't know, the CW began on April 12, 1861 when Confederate General P. G. T. Beauregard fired his cannons at Union Major Robert Anderson, who was in Fort Sumter. After enduring 34 straight hours of bombardment, Major Anderson surrendered and the Confederates moved in. (Interesting side note--Anderson had been Beauregard's artillery instructor at West Point!) When we got there, they had Confederate reenactors inside, occupying the fort as the real soldiers had done 150 years ago. They gave musket firing demonstrations and artillery drill. (Couldn't fire the real cannons, though.Too bad!) 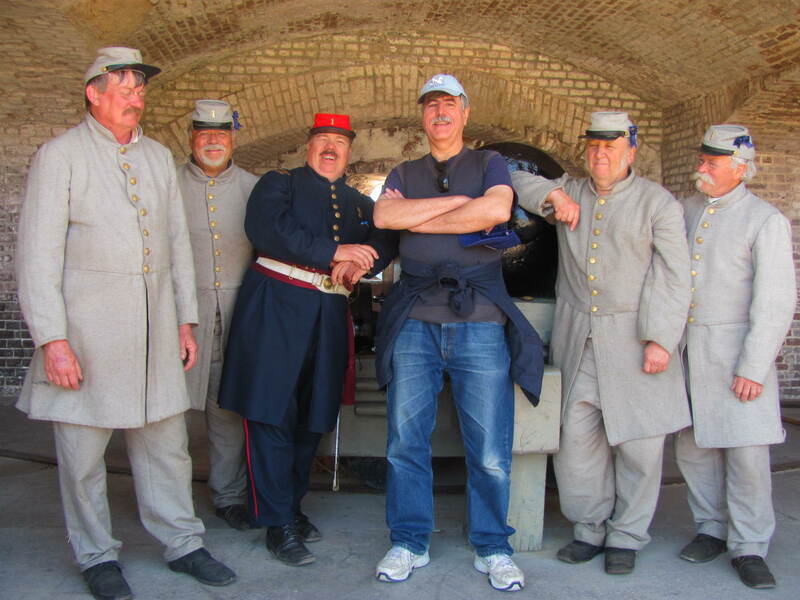 Here I am with Lt. Rhett and his South Carolina gun crew. Of course, my family never goes on a road trip without lots of books and at least a couple of audiobooks. After that last post about Beverly Cleary audiobooks, I checked out Henry and Beezus and, man, was if funny! There were several times when we laughed out loud. Especially when Henry's dog Ribsy steals the neighbor's main dinner course! Or when Henry tries to make enough money to buy a bike by selling bubble gum. Or when Henry wants to become famous by eating dog food. Or, most especially, when Henry wins a prize no guy would ever want!! Want to know more? Then you gotta check it out! And one more thing--last Christmas I got a Nook Color, a truly great gift. We took it with us and found that it's a great way to pass time in the car or even when sitting around the house.You can download books, of course, and read a lot of great stuff, but if there's wifi available, you can hook up to the Net. We used it more for reading but actually got on the library's homepage at one point and put The Throne of Fire, the next Kane Chronicles book, on hold! We all agreed that the Nook was a good thing to have along, but I found a couple things irritating. First, there are a lot of books you can't get. I tried to get the second book in the Raising Dragons series by Bryan Davis but they didn't have it. Or ANY of the books in that series! Or any of the Tiger's Apprentice books by Laurence Yep. Or any of the 39 Clues books!! Now how is that possible?? NONE of the 39 Clues books, one of the hottest series around? It was really frustrating not to be able to get things we wanted. The good thing about the library is being able to get the books you want, especially those that are out of print or that the book companies don't think are worth selling anymore. Secondly, we found out that we'd spent money for things we liked but may never read again. It was fun but now we have to pay the bill for books that we may or might not want to read a second time. That's another advantage of the library; you can get books for free and then turn them back when you're done. Then you don't have extra books cluttering your bookshelves or taking up memory. So, all in all, the Nook is wonderful but the good old library is better in some ways. What about you? Do any of you have a Nook? Do you like and dislike the same things about it? 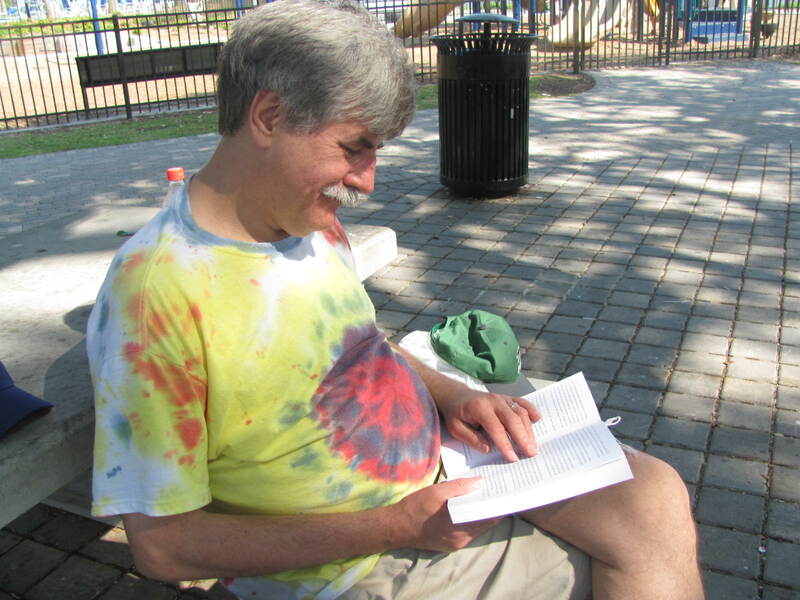 What's up, all you reader guys in Blogland? Getting ready for spring break? The kids in Charlotte start spring break next week and I bet some of them are planning vacation trips right now. How about YOU?? Are you going anywhere? If so, let me give you one word--audiobooks!! They are great! Pop one in your car's cd player or download one to your player and bam! the car trip becomes a LOT of fun. To see some reviews of audiobooks that I and your fellow reader guys have enjoyed, go to the "Labels-Quick Links to..." section on the left-hand side of the page and click on "audiobooks." Some of the best are by Beverly Cleary. I thought about them particularly because this week marks her 95th birthday! She has written a lot of great books for guys, especially the Henry Huggins and Ramona books. They are still funny!! Don't believe me? Then look at this review of a Ramona audiobook and this one of the Henry Huggins audiobooks. As they said, these things could still happen today! So check them out and let me know what you think. And if you've heard any other audiobooks that you really liked, write in and tell us! The Last Shots and The Winners! What an exciting March this has been! There were some incredibly major upsets in the NCAA tournament. My brackets are shot to pieces. Not ONE of the teams I predicted for the Final Four made it! Ah, well, that's what makes it so exciting. zzzzzzz. Yawn, welll those three crazy kids are on another crazy crime scene. At least four pets are stolen!! They get returend, but in exchange vauble things are stolen!!! Will the kids find the thief??? THIS BOOK IS AWESOME! ZZZZZZZZZZZZ... Those three cowards are on another case. Remember the mysterios author? Well her name is Wallis Wallace. She has invited the three kids over. She said that she hears strange noises in her house. the three kids go into a play-house. Wayside School is getting more funnier than ever! There are stories about socks, pencils and even more! In this third book of wayside school and even more! I recommend everyone to read this book. 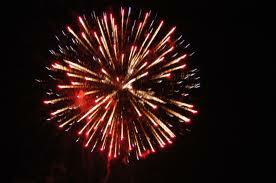 It is very exciting and funny! This book is fantastic! There is a lot of action! Ash and his friends go to get Ashes Marsh Badge. But first, Ash must defeat Sabrina. Only ghost Pokemon can defeat her psychic Pokemon. Will Ash get his badge, or will he stay there? Read the book to find out. I liked this book because it had lots of action. I encourage you to read it. this book is about a wimpy kid that goes to a new school a notices something. on the blacktop outside, there is an ugly cheese. someone touched the ugly cheese, so the school started something called the cheese touch. will the cheese go away? read the book to find out. i liked this book because it was funny. i recommend you to read the book. this book is great! percy goes to a new camp called called camp half blood. percy discovers that his father is... oops. i can't tell you.people in his camp are telling him that Zeus's lightning bolt is missing! Zeus thinks it is percy, so he accuses him. later on... someone put a lightning bolt in his bookbag. will percy find the bolt? read the book to find out. WOW!!! SUPER SIMRAN is the undisputed winner!! YAAAAYYYY!!! Super Simran, you can come to the Myers Park library and claim your prize. Or, if you can't, I'll make sure you get it. Same for you, all you second placers. And you too, Sarah! You're our third-place winner. Hey, wait a minute--we have FOUR boys in second place! That's Michael, Ryan, Soccer Shawn and Davidson. Congratulations, guys! This has never happened before. Well, this is great! It shows that lots of boys enjoy reading and that's what this blog is all about. We have lots of prizes in the box, so there will be plenty for all of you. As I said, come to the Myers Park library and get your prizes or I will find a way to get them to you. ---a girl is the overall winner at the BOYS Read blog!! This has never happened before either. 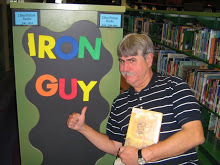 Fortunately, the Iron Guy is not made of inflexible metal (the iron is only for toughness!) and can enjoy any new situation. I think we can all be happy that kids, boys and girls, enjoy reading. In fact, this just goes to show that girls can enjoy good reads as much as boys. And--celebrating a girl winning the Boys Read contest shows just how good-natured boys really are, giving the world more proof of the awesome greatness of boys!! Seriously, though, this has been a great contest and I thank all of you for writing in. Now don't think this means you have to stop!! We still want to hear about good reads! So keep sending in those reviews and I'll keep posting them.OK? OK! !